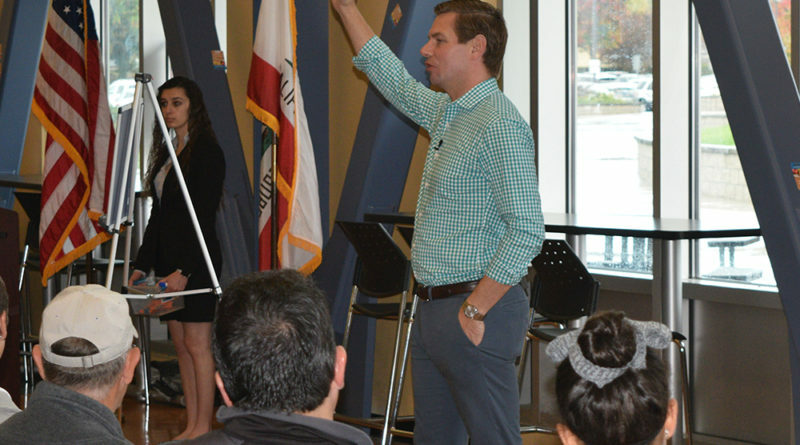 Congressman Eric Swalwell came to Dublin High School and held a meeting about the upcoming year in politics. Including investing in modern schooling and American students as well as reforming gun control. He also mentioned how voting will change in the future and how there will be an era of reformation after Trump. One of Swalwell’s topics was about investing more money in schooling to ensure all students would have the same opportunities regardless of that district’s wealth. That means schools could get more funding for materials such as textbooks, equipment, teachers, and other resources. With more funding, students will learn a wider range of topics which will help them increase their job insights. Swalwell also hopes invest in student visas and “modern schooling” equally, giving American students as much of an opportunity as international ones. On the topic of gun control, Swalwell proposed the buying back and confiscation of all assault rifles. Though he had no problem with people owning a rifle for hunting or a handgun for protection, he thought assault rifles were unneeded and dangerous. Swalwell wants to prioritize student safety on campuses. Swalwell also predicts a change in how people will be voting in the future, such as on cell phones. “I don’t want the Russian attack take us back to the dark ages where we were dipping our thumbs in purple ink to prove that we voted,” he said. Moving forward, voting on your phone will increase the accessibility of voting. It will potentially increase the amount of young voters in upcoming elections. Lastly, Swalwell predicts an era of reformation after Trump. Swalwell has written legislation that would help prevent something such as the Russian attack from occurring in future elections. The newly elected Congress will also bring new ideas and new energy to politics as they begin their term. Swalwell thinks with a more diverse and youthful Congress that looks more like America will bring America into the future.